The obverse of this coin shows a head of Athena in right profile, wearing a crested Attic helmet decorated with three olive leaves above the visor and a spiral palmette on the bowl. Her hair sweeps across her forehead in two loops of parallel strands and is visible beneath the helmet's neck guard. 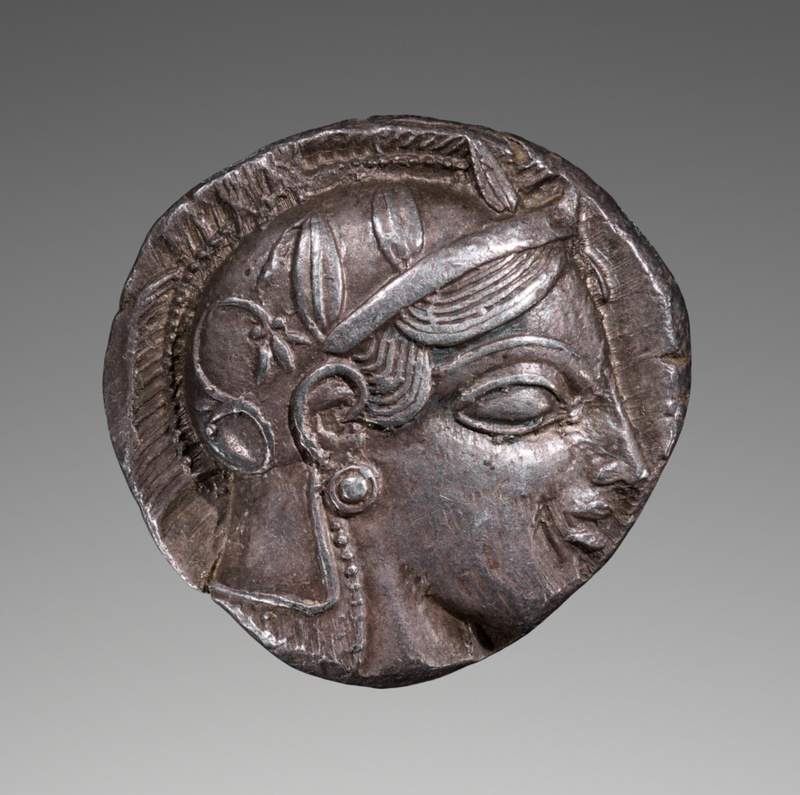 She has an archaic smile and a frontal almond-shaped eye, an anachronistic style preferred for this coin type. The design goes to the very edge of the coin, partially cutting off Athena's chin. On the reverse, an owl stands to the right, its head turned to the front and tilted slightly. Its wing and three tail feathers are clearly delineated in high detail. There is a two-leafed olive sprig in the top left corner and a crescent, possibly a waning moon, just above the owl's wing. The inscription, ΑΘΕ, located in the bottom right, is an abbreviation of ATHENAION, "of the Athenians." The owl is struck in high relief and framed on all four sides by the shape of the die. 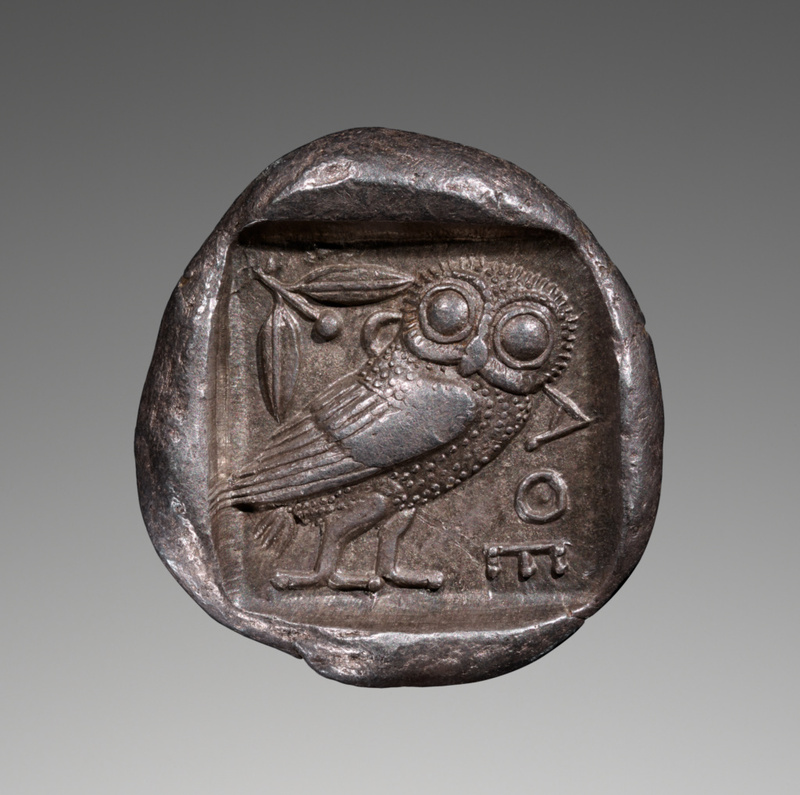 Athenian "Owls," as they were called, were minted in Athens for over four hundred years, beginning in the 510s B.C. Although the style evolved, the coins retained the same basic design of Athena on the obverse and her patron owl on the reverse. This coin is one of ten Athenian tetradrachms found in a hoard of coins, ingots, and jewelry discovered in 1967 on the Jordanian-Syrian border in the region of Hauran (near the ancient city of Bostra). The hoard contained coins from over twenty mints, the majority from four areas: Athens (31), Cyprus (21), southwest Asia Minor (15) and the Thrace-Macedonian area (13). The distribution and style of the Athenian coins date the hoard's burial to around 445 B.C. The Jordan hoard, and other examples of Greek coin hoards, speak to the circulation of Greek coins in the Near East and Egypt to be used as bullion. Private Collection, sold on consignment from a Canadian collection through Frederick S. Knobloch, 1969. Hesperia Art, Philadelphia. Bulletin XL/XLI. n.d, lot 47, fig. 47 obv., 48 rev. Kraay, C.M. and P.S.R. Moorey, "Two fifth century hoards from the Near East." Revue numismatique, 6th ser., 10 (1968), pp. 181-235, no. 43, pl. 20. Knobloch, Frederick S. Ancient Coins: Fixed Price List (New York: n.p., April 1969), p. 23, fig. C.12. Starr, Chester. Athenian coinage 480-449 BC (London: Clarendon Press, 1970), Group V.B, Series 3, 189 (O162/R178). Thompson, Margaret, et al. An Inventory of Greek Coin Hoards (New York: Published for the International Numismatic Commission by the American Numismatic Society, 1973), no. 1482, pp. 202-203. Leu Numismatik AG, Zürich. Antike Münzen: Auktion 65. May 21-22, 1996, lot 167, ill.
Sunflower Foundation. Drachme, Dirhem, Taler, Pfund: Geld Und Währungen in der Geschichte : Von den Anfängen bis zum EURO : Eine Auswahl aus dem Moneymuseum.com. (Zürich: Sunflower Foundation, 2002), pp. 13-14, ill.
MoneyMuseum and Ursula Kampmann. Drachme, Dirhem, Taler, Pfund: Geld und Währungen in der Geschichte : von den Anfängen bis zum Euro. (Zürich: Sunflower Foundation/MoneyMuseum, 2010), pp. 7, 12-14, ill. Classical Numismatic Group, Inc., New York, Triton XVIII. January 6-7, 2015, p. 191, lot 510, ill.